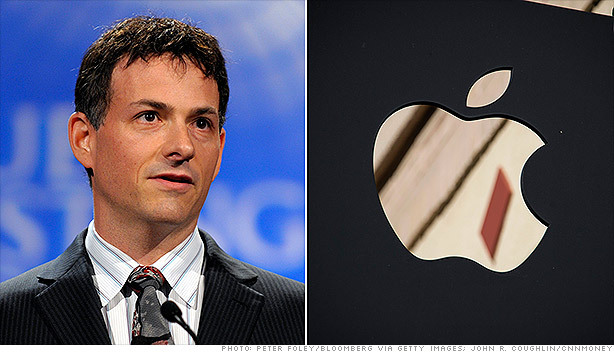 Einhorn to Apple: Give us more cash! Activist investor David Einhorn publicly called for Apple (AAPL) to give some of its $137 billion cash hoard to back to shareholders in the form of preferred stock. Einhorn said in a press release Thursday that he has held meetings with Apple executives explaining how they could unlock "several hundred billions of dollars" by distributing a perpetual preferred stock. Apple, he said, rejected the proposal in September 2012. "Like many other shareholders, Greenlight is dissatisfied with Apple's capital allocation strategy," Einhorn, founder of the hedge fund Greenlight Capital, wrote in a release. "Apple has $145 per share of cash on its balance sheet. As a shareholder, this is your money." In addition to turning down Einhorn's proposal, the iPad and iPhone maker will now let shareholders vote at the company's annual meeting on February 27, 2013 on whether to block the possibility of ever issuing preferred shares. That did not make Einhorn happy. "Greenlight believes that Apple's proposal to eliminate preferred stock from its charter is an unprecedented action to curtail the Board's options," Einhorn wrote in his release. "Greenlight is not aware of any other company that has ever taken this step voluntarily." Einhorn also said Greenlight filed a lawsuit in federal court Thursday morning asking the company to change its plans on preferred stock in order to conform to SEC rules. Apple responded Thursday afternoon. "Apple's management team and board of directors have been in active discussions about returning additional cash to shareholders. As part of our review, we will thoroughly evaluate Greenlight Capital's current proposal to issue some form of preferred stock." In its release, Apple noted that the company had already returned $10 billion to shareholders and has plans to return another $35 billion. Shares of Apple rose 3% Thursday, with most of the gains coming after the company issued its statement. Apple is particularly vulnerable to shareholder activists right now. The company's stock is down more than 35% since hitting an all-time high above $705 in mid September. Investors have become increasingly concerned about Apple's ability to maintain its strong levels of revenue and profit growth. Still despite waging what looks like a public war against Apple, Einhorn praised Apple's CEO Tim Cook during a television interview on Bloomberg. "I have no reservations about Tim. The performance of the company under him has been terrific." Einhorn's criticisms simply relate to how Apple uses its vast reserves of cash. There have been rumors that Apple may consider increasing its stock buyback program or boost its dividend in order to enhance shareholder value. Apple's shares are down more than 35% since September 2012. At a May conference, Einhorn said that he thought that Apple could become a "trillion dollar company." After losing more than $230 billion in value since September, Apple's valuation is currently less than half of that: $428 billion. In Thursday's release, Einhorn said that his fund has been a shareholder since 2010 and is committed to remaining a "long-term shareholder." Greenlight Capital held roughly 1.1 million shares of Apple as of September 30, 2012. In a year-end letter to investors, Einhorn said he increased his stake in the company. Greenlight will reveal its holdings as of December 31, 2012 in mid February via an SEC filing.